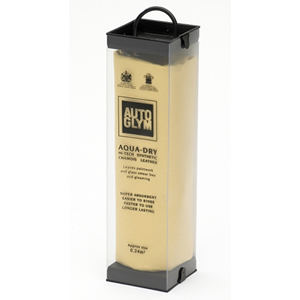 Autoglym Aqua-Dry is a synthetic leather with a unique structure which actually outperforms natural chamois leathers. It is super absorbent, easier to wring out, faster to use, longer lasting and less expensive. Regularly washing your vehicle with Autoglym Bodywork Shampoo Conditioner, followed by a quick wipe with an Aqua-Dry, preserves the smooth glossy finish imparted by Autoglym Super Resin Polish. It also gives you the bonus of sparkling windows.